The recent changes in the Income Tax Code have impacted many financial planning strategies. One of the happier outcomes has been the treatment given 529 Plans. Simply put, these plans are a premier way to fund education expenses. When I was very young - this is a true story - I remember my grandmother telling me (or perhaps I overheard...this was in 1986) of her participation in Michigan's Education Trust (MET for short)...I recall my ears perking up a bit (looking back, this was foreshadowing - I will save the stories of her taking me to the bank for a different article). Recognizing the escalating costs of a college education, Michigan's then (1986) Governor, Jim Blanchard, enacted state legislation allowing the pre-payment of future college tuition at today's prices. In 1986, public college annual tuition ran a cool $1,700, so if you paid $170 (10%) in 1986, you could then use that 10% in future years to offset that day's tuition rate. To be fair, Wyoming and Florida had similar ideas - full disclosure, I did not spend Summers in either state growing up, I was in Michigan. To date, I have not set foot in Wyoming, though it is on the list! Recognizing this great deal, 55,000 Michigan residents enrolled in the plan. Since MET was an investing vehicle, the Federal Government thought income taxes were owed on any capital gains MET earned. Obviously, Michigan disagreed, resulting in an argument that would ultimately be settled in...wait for it - the Sixth Circuit Court of Appeals. Ultimately, Michigan won out and the MET plan was ruled a tax-exempt instrument of the state (of Michigan). After considering things, the US Congress thought it would be a great idea to seek tax relief for ALL college savings vehicles. Thus, Section 529 of the Internal Revenue Code was born. This type of 529 relies on future tuition inflation, which unless you have completely ignored tuition prices in recent years, is a cinch to increase. The drawback of this type of plan is that you are beholden to that state. Each specific state has their own caveats if you don't use the money...in the interest of space, I won't go into the details of each here. 2) 529 Savings Plans. These plans take deposits and invest in various financial instruments (typically mutual funds) offered by the plan chosen. The performance of these types of plans relies on investment growth and is totally independent of any tuition costs. These plans may be administered by states only, although the investments offered are via well-known institutions like Vanguard. Of note, off-campus housing costs are also allowable, though only to the limit of on-campus room and board costs as advertised by the college in their "Cost of Attendance" used for financial aid purposes. Also, Student Loans and Interest on them ARE NOT qualified expenses. Contributions. There are no Federal Income Tax deductions presently (2018) available for 529 Contributions. However, if you are a resident of the following states, there are State Income Tax benefits: Arizona, Arkansas, Kansas, Minnesota, Missouri, Montana and Pennsylvania. Please consult your Tax Advisor for specific benefits, they vary (widely). Capital Gains & Dividends. So long as 529 Plan money is used for the purposes outlined above, any Capital Gains and Dividends are Income Tax free....this is a great benefit to your college savings and should not be ignored when you formalize your college funding strategy. No Annual Reporting. While you are accumulating money in your 529 Plan, i.e. not making withdrawals, there are no annual financial reporting requirements on your Federal Tax Return, thus simplifying record keeping. Transferability between Plans. You are free to move funds between 529 Plans and you need not spend the funds on the state plan within which you invest. i.e. if I participate in the Arkansas Gift 529 Plan, I can still send my child to Harvard. Account Ownership. For 529 Plans, account ownership is established at account opening. While the account owner names a beneficiary, who may be himself/herself or anyone else, the account owner maintains ownership of the funds. Moreover, with one notable exception (UTMAs & UGMAs), the beneficiary has no control over the funds whatsoever. This is a distinct difference from UTMA/UGMA Accounts. Limitations on Contributions. Since 529 Contributions are considered "completed gifts", there is an annual limit to how much you may contribute to your account. In 2018, that number is $15,000. For married couples, each parent may give the $15,000 for a total $30,000 contribution. Once exception for 529 Contributions allows an account owner to contribute 5-Years' worth of contributions in one-year (this is call the "5 Year Carry-Forward Rule"). This means in 2018 a single owner can contribute $75,000 and parents can collectively contribute $150,000. Then, the parents may not contribute to the account for 5 years. There are Lifetime Gift exceptions, which I will not discuss here in the interest of time. Transferability. An account owner is allowed to change the beneficiary of the 529 Plan funds at any point to a member of the current beneficiary's family. In this case, the word "family" has an exceptionally broad definition as it includes pretty much anyone in the family tree down to a First Cousin. For most, transferability typically involves moving funds between brothers and sisters. Needless to say, examine the rules in detail if you are straying outside a brother or sister of the current beneficiary. This is a very powerful tool for funding college expenses . Estate Planning. 529 Plan Assets are not included in a deceased's Gross Estate for Estate Tax purposes. Thus, 529s are a way to reduce estate size during one's lifetime while still maintaining a measure of control "beyond the grave". The money must still be spent on college, though for those with numerous descendants, there is likely not going to be a shortage of ways to spend money on college - just perhaps. Completed Gifts. When an account owner makes a contribution, the money going into the plan may only be used for education expenses. Thus, you will be unable to simply take back the contributions without penalty if other financial needs arise. Penalties. For any "Non-Qualified" Withdrawals. If the account owner makes withdrawals for non-education expenses, the proceeds are taxable, which includes a 10% Penalty. For example: If you contribute $100,000 to a 529 over time and it grows to $200,000 and you withdraw the entire amount, you will be taxed on the $100,000 gain at regular Income Tax Rates (no Capital Gain treatment) in addition to a 10% Penalty ($10,000 in this case). So please plan on using money you contribute to a 529 for education expenses. American Opportunity Tax Credit (AOTC). If you are contemplating availing yourself of the AOTC, you should ensure you spend $4,000 our of pocket on Qualified Education expenses. Moreover, if you are contemplating this strategy, you should consult a Tax Professional as the caveats associated with tax credits can be a wicked jigsaw puzzle. Reallocations. As of this writing (2018), you are permitted only two (2) reallocations are permitted this year. While this may seem cumbersome, this is not - in my view - a serious impediment as the typical allocation is "Age-Based:=", so reallocations are typically take care of for you via the plan administrator. Financial Aid. College Financial Aid is quite involved. 529 Accounts owned by someone other than the student or his/her parents can impact the student's financial aid. If there are multiple 529 Accounts in play for a prospective student, consult a Financial Aid expert to optimize the student's opportunities for financial aid. 529 Plan Differences. Unfortunately, not all 529 Plans are created equal. Some plans are far superior in how they are administered and the costs they charge to participate in them. Happily, there is a bevy of literature available evaluating all the plans in the country, so selecting a reputable and well-reviewed 529 Plan. Suggestion #1: Save Early and Often. Most 529 Plans are owned by parents and intended for their children's use. Therefore, the investment is considerably shorter than for other goals, i.e. One's Retirement. Consequently, contributions are going to weigh considerably more in the final account balance than the investment returns. Thus, saving a heap of money is required if you intend to fund an entire college education for your child. Suggestion #2: Spend some time on planning for Post-9/11 GI Bill use. For military members, you may have a considerable tool set available for piecing together college education for your children: Post-9/11 GI Bill funds, 529 Plan Funds, Military-affiliated scholarships, etc. Therefore, it would be wise to consider the optimal way to fund college. There are plusses and minuses with each benefit. For example, gifts of Post-9/11 GI Bill benefits might be permanent, thus necessitating their use first. Whatever the case, enlisting the help of a financial expert might be advisable if you are unsure how to employ the tools at your disposal. Suggestion #3: Be judicious with 529 Funds for Primary Education expenses. While the Tax Cuts and Jobs Act of 2017 permits the use of 529 funds for K-12 education expenses, this may be of little advantage to you. Most parents start saving for college after a child is born, which leaves a comparatively short period of time to accumulate the considerable sums needed for college expenses by the time kindergarten starts. Of course, everyone's individual situation is unique and there very well be circumstances where 529 fund usage is appropriate for primary education expenses. However, for most, paying primary education expenses out-of-pocket and investing for college may end up being the most efficient option. Suggestion #4: If your state has an Income Tax benefit for contributions, have family members gift money to the parents, not the 529 Plan. For the states where an Income Tax benefit is in the balance, it is more tax efficient for others to gift money to the parents, who can in turn make the 529 contributions directly, thus garnering the Income Tax benefit. Admittedly, this is on the periphery of tax efficiencies, though it is an efficiency nonetheless. Suggestion #5: Keep Detailed Records. While Qualified expenses are free from Income Tax, they are not free from keeping accurate records of the transactions. Therefore, keep all the receipts and invoices from the Education Institution receiving your 529 Funds. Moreover, save your 529 Account Statements. This way, you can re-create what happened in case you ever have to do so. Conveniently, the ubiquitous on-line storage mechanisms (iCloud, Google Drive, Dropbox, etc.) are available to memorialize things in perpetuity. Suggestion #6: Pay College Expenses Directly, NOT via direct disbursements. 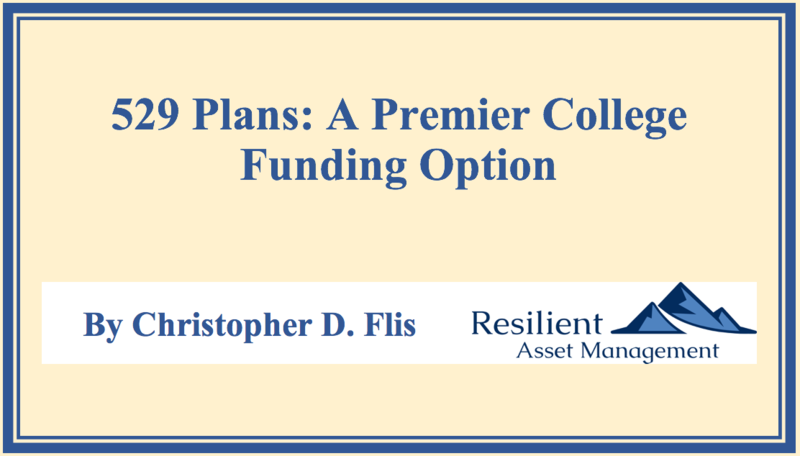 Colleges treat direct disbursements from 529 Plans differently. Some treat them as scholarships, others as regular payments. You do not want to leave anything to chance, so have the 529 funds sent directly to you and then pay the funds with your own check. Suggestion #7: Make 529 Plan withdrawals in the same year expenses are incurred. This is a biggest factor for the Spring Semester starting in January. Make sure you make the plan withdrawal in the same yer when the bill is due. Dong so will align your expenses and payments in the same tax year. And on this note, if you have multiple children and multiple accounts, make sure the withdrawal comes from the correct student's account. Once the herculean effort of graduating a child (or children) from college, you may have funds remaining under the 529 umbrella. If so, one option is to withdrawal the money. However, a perhaps more prudent option is to simple leave the funds where they are. That way, you avoid any sort of tax on the funds. Additionally, the money can simmer for your grandchildren's use - a true gift if there ever was one. And finally, if there is no legacy use, then you will have the funds available in retirement for your own education...it happens, and the tuition breaks for seniors will bring a smile to your face.